May 14, 2015 – Riley BB King was born on September 16, 1925. Little new can be said about BB King, who passed away in his sleep at age 89 on May 14, 2015 at his home in Las Vegas, Nevada. He was the King of the iconic living bluesmen of all time, the legendary BB King. He was born in Indianola, Mississippi and acquired the moniker BB King from his Memphis Days when he gained guitar wizardry as Beale Street Blues Boy. In the late ‘60s, it was practically a given that every rock and blues six-stringer would cite his momentous album, “Live at the Regal” as his or her favorite record. The subtle horn-like phrasing, jazzy inflections, dramatic structuring and incredible human-cry finger vibrato of his playing were unapproachable marvels for fretboard fanatics. And you didn’t have to know diddly–squat about the guitar to feel the way his shortened bursts sent sparks flying through your soul. When it comes to American treasures, rank B.B. King right up there with the Grand Canyon and Baseball. The legendary bluesman, who once sweated for a few cents a day picking cotton, is one of the most masterful singers and instrumentalists this nation has produced, overwhelming us with searing solos and thunderously shouted vocals that scarcely need a microphone to be heard. His vibrato style of playing influenced a generation of rock and blues guitarists, including Eric Clapton, Mike Bloomfield, Gary Moore, Stevie Ray Vaughan and even modern day guitar wizards like Joe Bonamassa, Kenny Wayne Shepherd and Jonny Lang. That was the greatness of this man! BB performed more than 15,000 concerts here on earth. Tonight all guitar wizards that went before BB will be merely sidemen in a concert for the ages at Rock and Roll Paradise’s main stage. 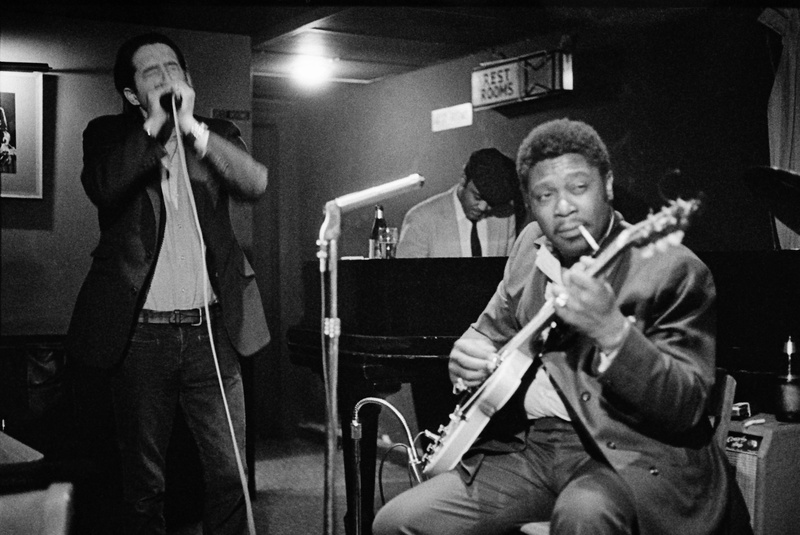 The photograph shows BB King and Paul Butterfield, jamming after Hours at the Jazz Workshop, Boston. They had all performed that day in a concert at Harvard Stadium in Cambridge. I bet Butterfield can’t wait to get his harp out tonight and jump on stage. This video is an an impression of what must have played on the main stage of Rock and Roll Paradise on May 14, 2015 when BB King and Gary Moore reunited.